Project Watershed, as part of their Blue Carbon efforts and habitat restoration activities, collected 2500 donor eelgrass shoots and then transplanted them into an area devoid of eelgrass off Port Augusta Park in the Town of Comox. These restorations provide habitat for migrating fish and other wildlife as well as increasing the blue carbon sink in our estuary. The effort involved Project Watershed staff and over 9 volunteers during the low tide on August 8th and 9th. “These donor and transplant locations are part of our research sites and will be monitored for carbon sequestration over the next five years”, states Christine Hodgson, lead scientist for the project. “We have taken core sediment samples at various locations and this particular location that we planted was barren”, says Paul Horgen, Chair of Project Watershed. Future measurements will give an indication of how much carbon dioxide is being removed by this newly planted site. During this restoration effort intertidal eelgrass, which is the eelgrass you see at low tide right at the tide line, was reestablished. Later this month more intertidal and some subtidal eelgrass will be planted. Divers will be involved with the subtidal efforts. 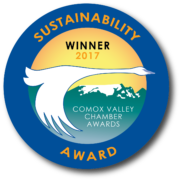 Funding for the project is from The Council for Environmental Cooperation a three country partnership of Canada, the USA and Mexico and from the Pacific Salmon Foundation. 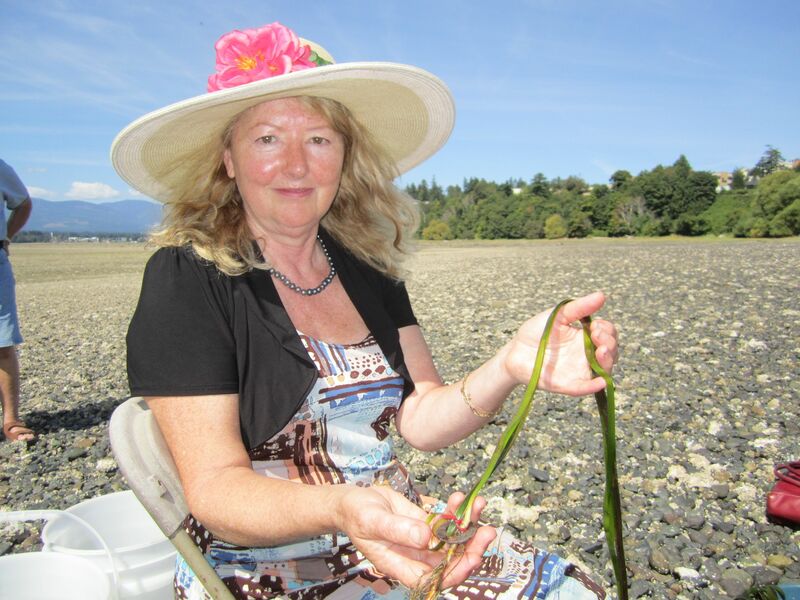 Barbara Price (Town of Comox Councilor) with eelgrass shoot. Nearly 6000 m2 of eelgrass has been restored during the summers of 2013 and 2014. At a recent Fisheries and Oceans workshop in Ladysmith a few weeks ago, it was reported by the Contractor who sub-contracted with Project Watershed for the eelgrass planted last year that we have a 95% success rate. 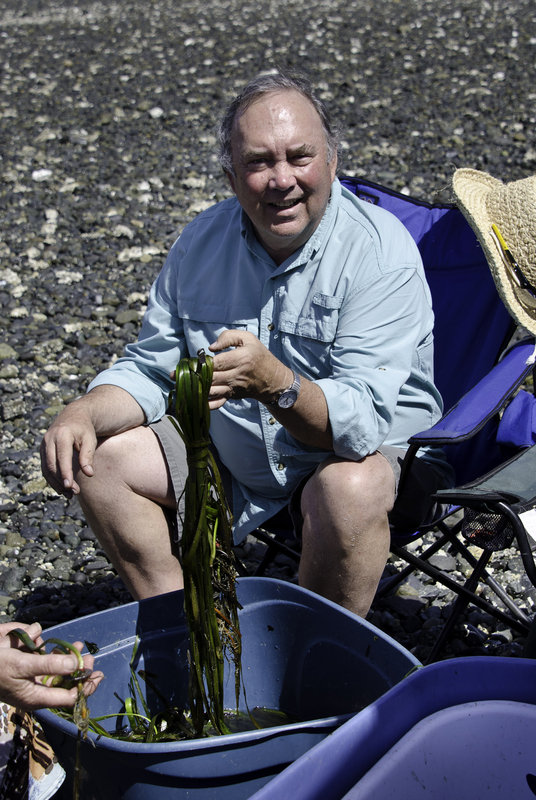 Jim Gillis (Comox Valley Regional District – Director Area B) – tying eelgrass. 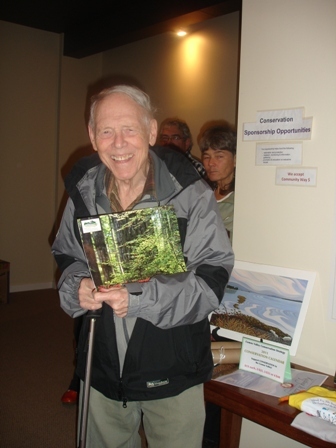 Horgen specifically extended invitations to the Mayor and Council of Comox to come and observe the eelgrass collection and transplanting. While Mayor Ives had a prior commitment, Councilors Price and Fletcher found the time to observe the restoration activity. We want to encourage more politicians to become engaged in environmental stewardship activities. 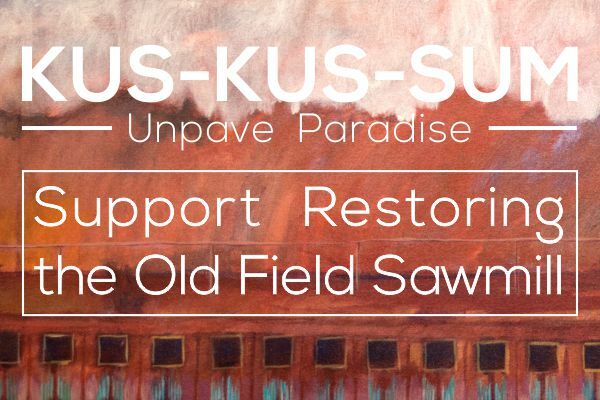 “Although it is a busy time an some individuals are away on holidays, with an election coming in November, it is useful for constituents to know which political leaders put the restoration of damaged habitat as a priority and a valuable community activity to support”, states Horgen. It is clear that Price, Fletcher, Ives as well as Regional Director Jim Gillis, who was given a recognition award in May by Project Watershed, fit into this category. Additional eelgrass work is planned for later in the month and in September. And Project Watershed will soon initiate salt marsh shoreline restorations later this month and in September. Anyone wishing to be a volunteer on these projects please call Project Watershed at 250 703 2871 or e-mail projectwatershed@gmail.com.